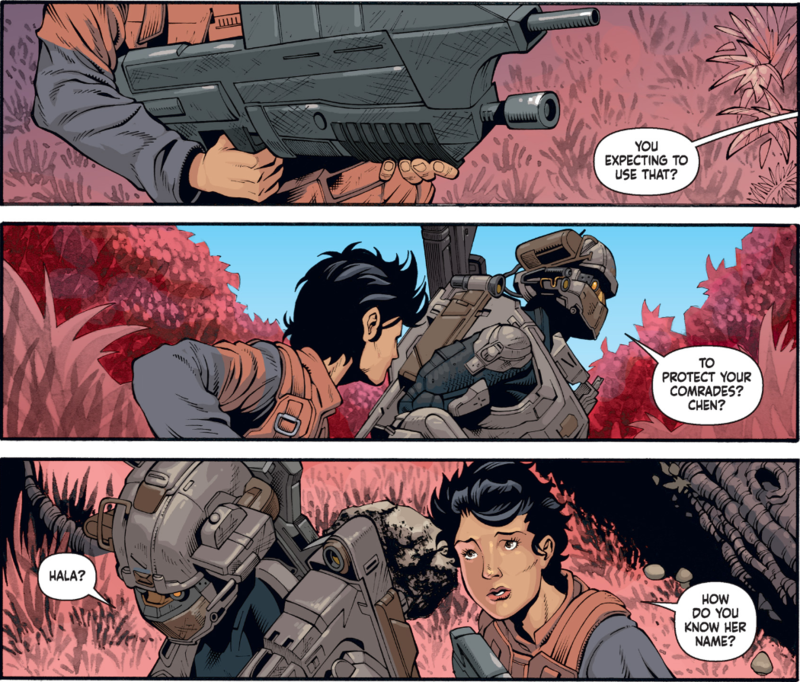 It is a particularly joyous occasion when I get to say “Another month, another Halo comic,” as the second of Lone Wolf’s four issues has dropped. 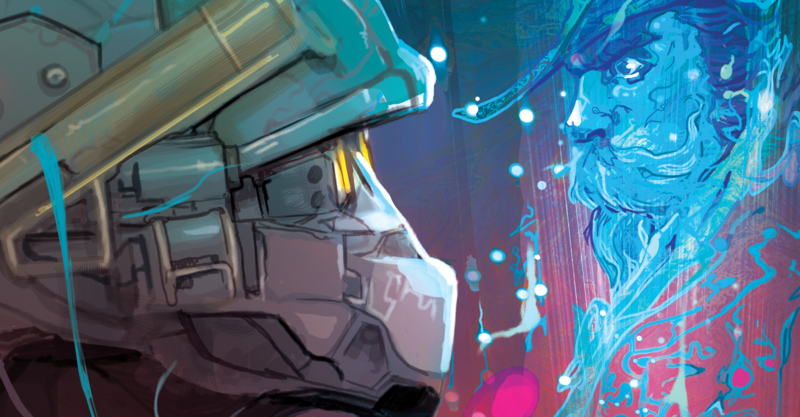 The momentum of quality persists, as this instalment brings us more of the strong, character-driven writing that has come to be emblematic of Halo’s comics over the last two years. Linda continues to get some great characterisation, and there are several twists that drastically change the parameters of her mission. 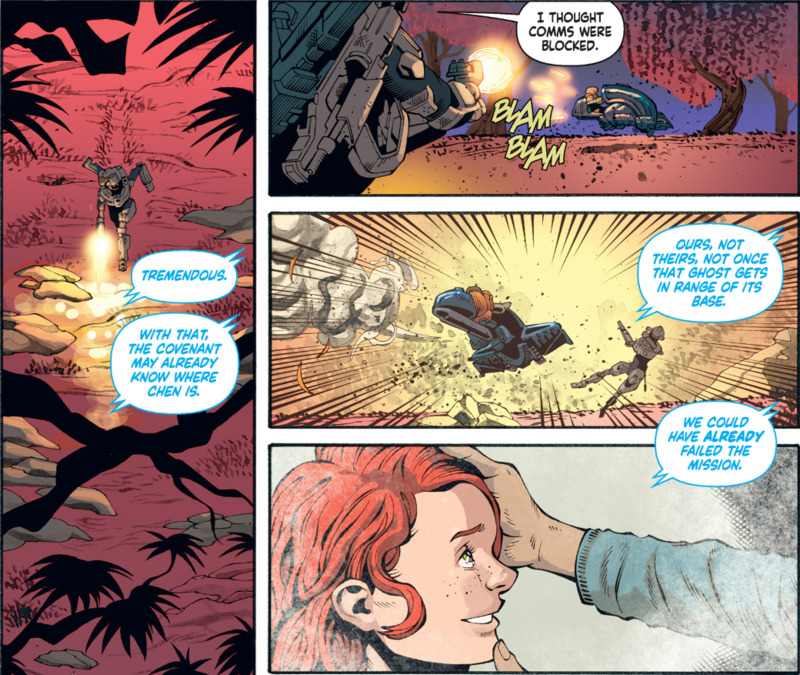 Issue #2 picks up where the first left off, but that tension is immediately side-tracked by Shel informing them that they’re not done yet – the group opening fire on an energy sword-wielding Sangheili. Once dispatched, everybody’s attention turns to Linda. She is immediately set upon with questions about the war and whether the UNSC or Covenant is coming. As established in the previous issue, these people have had no communication with anyone since fleeing from the fall of Reach. 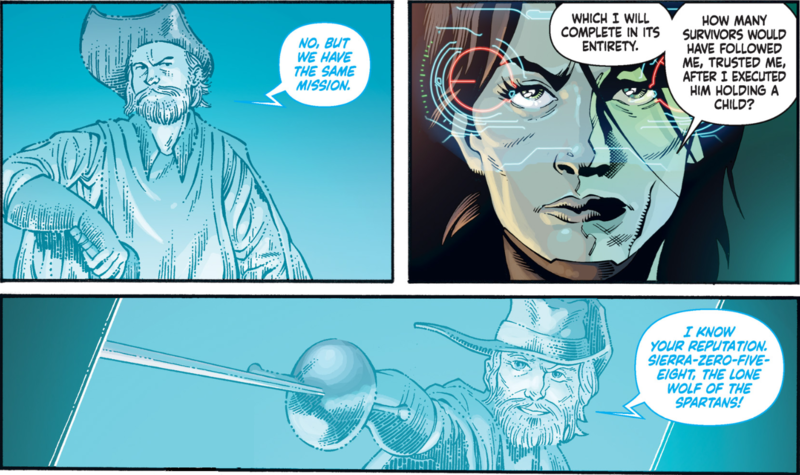 Dumbfounded that Linda hasn’t simply shot Chen on the spot – given her reputation, brought up in the previous issue, as a soldier who “will do what’s necessary,” this being the reason she was chosen for the mission – Athos continues to question her actions that entirely contradict the UNSC’s ‘understanding’ of her. Employing a not-entirely-dishonest lie of omission, saying “I didn’t come for war. I came for you. For all of you,” Linda complies with Chen’s demand and removes her helmet. At this moment, Shel angrily weighs in on the notion that, having been seemingly abandoned by the UNSC, they’re supposed to welcome her now. As she tells Linda to go back to the war, Linda interrupts and informs them that the Human-Covenant war – as they knew it – is over. The atmosphere completely changes with this unexpected NOVA bomb of information, the people of the settlement hugging jubilantly as a thousand new possibilities seem to materialise for their lives. They didn’t just escape, they’re not the last of humanity – as they thought they were in Issue #1. Chen, however, does not appear to share his peoples’ joy. Linda also says that their victory “came at a price,” a subtle, understated reference to the assumption that the Master Chief is most likely dead after the events of Halo 3 (you may recall from Halo: Glasslands that Blue Team were canonically present at the Voi Memorial). Putting her helmet back on, Athos asks her who will “pay the price” if she leaves Chen alive? Caught in contemplation, Chen realises that there’s something Linda isn’t telling them. Why has she come now, after all this time? His opportunity to press further is interrupted by the arrival of a lookout who informs them of Unggoy at the north perimeter who got away, putting them in danger of having the settlement’s location exposed. Before Chen can finish speaking, Linda sprints off to handle it. This line of questioning from Athos in the panels above really gets at the heart of Linda as a character, placing her under a microscope. Despite the fact that she seems terse and adversarial, even amongst the Spartan-IIs outside of Blue Team, and her MJOLNIR armour makes her look like the many-eyed giant out of Greek mythology, Linda puts the people first. In the previous issue, the Commander who assigned Linda this mission stated that Chen is the priority. I noted that, though the war is over, Linda is being sent to kill one of their own people as if the extinction-level threat of the war is still going on – prioritising the taking of lives over saving them in this period of relief and reconstruction for humanity. The Commander barely gave the people a second thought, dismissively telling Linda to extract them “if possible,” but to focus on Chen. Linda, however, does not intend to follow that directive quite as tightly as her superiors would’ve liked. She initially defends herself against Athos’ questioning by pointing out to him that none of the survivors would’ve followed or trusted her if she’d executed him as he held a child, but Athos calls her on that point by saying she was unseen and had a clean shot at one point. Her retort for this is the Yanme’e showing up, that she couldn’t shoot both – an excuse Athos is sceptical of, as any reader who is familiar with the insane feats Linda has demonstrated as a sniper would be. The first issue, in fact, opens with Linda shooting both Fred and Kelly in mid-air – Fred on the platform above her, Kelly below. It would seem that Linda has her own ideas about handling Chen that don’t involve putting a bullet in him. Something of a motif is developing with these flashbacks for Linda, this one being more brief than the one in the first issue, and somewhat more ambiguous. Both times, these flashbacks have been prompted by Athos. 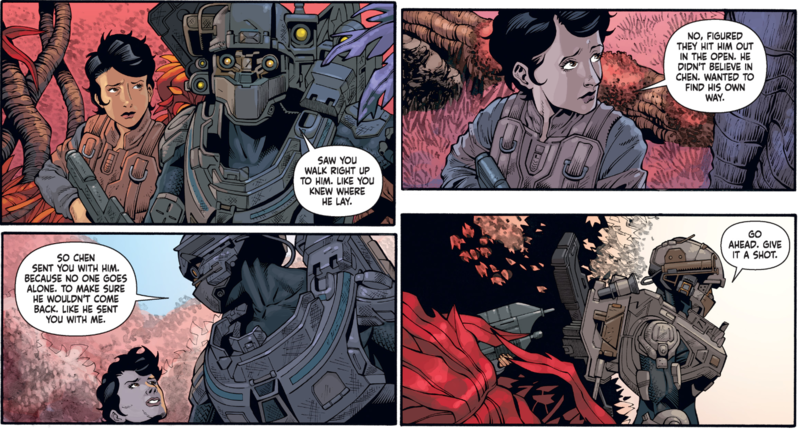 In the previous issue, it was his ardent insistence that Linda intervene to save Shel and Hala as a Kig-Yar got the jump on them; this time, it’s Athos’ irate contemplation that they may have failed their mission because Linda didn’t simply kill Chen when she had the chance. Both times, these flashbacks have been prompted by Linda’s refusal to pull the trigger. Here, we also see the communications block mentioned, something that it was presumed the Covenant were doing… we’ll come back to that in a bit. She does this. Checking the Ghost to see if the Unggoy managed to communicate with the Covenant base to reveal the location of the settlement, we cut to Linda returning to Chen to inform him that they have indeed been compromised. Shel and Hala stand in her way, attempting to impede the Spartan from getting close to Chen, who appears to be working on something. Insisting that they need to prepare to leave immediately, Hala refuses and says they’re not going anywhere with her because Chen is working on getting them out of here. Linda states that she can get them out now, as she has a ship. Again, the blocked communications comes up as Shel asks why she can’t call for UNSC reinforcements. Offering any who volunteer the chance to leave with Linda, the people fall on Chen’s side. In choosing to put the people first, to make them the mission, rather than killing Chen, this becomes a much more complicated situation for Linda to have to navigate. Doing what is right is by no means aligned with what is easy. Chen states that they can leave on their own ship once the NAV unit is fixed, having had a year to prepare. Linda, however, points out that she saw what happened to their last settlement and asks what will happen if he doesn’t finish this time, to which Chen responds that maybe they can use Linda’s ship for when the Covenant come. Right? Cutting to the Covenant’s perspective, a Reach-era Sangheili Officer and Ranger (with a unique helmet that Jeff Easterling remarked has “got some deep roots”), who are, in fact, now fully aware of the presence of a Spartan. “Something”… as in, not the Covenant. It is at this point that we might typically expect some sort of Forerunner MacGuffin to come into play, informing the conflict from hereon to be around this doomsday device. But it’s revealed that the Covenant are simply gathering supplies for the Didact’s Hand. The explanation here is something far simpler, I think. It’s interesting to note that the first issue didn’t make too much of a fuss over the exact placement of this story in the timeline, the extent of its relevance was that it was simply ‘post-war,’ some months after Halo 3. This issue, however, makes that element a lot more relevant to the story, as it brushes against some of the larger events that are going on. Arriving back at the settlement, Linda and Athos temporarily (and amiably) part ways – plugging into Chen’s computer systems in order to see what he can do about communications, as they have a maximum of two hours to prepare for the Covenant’s assault. Chen, meanwhile, sends Shel to ‘accompany’ Linda to her ship. There’s some interesting role-reversal here as Linda is the one who talks and asks questions, only to be met with silence from Shel. It is only upon mentioning her daughter’s name that she breaks the facade. 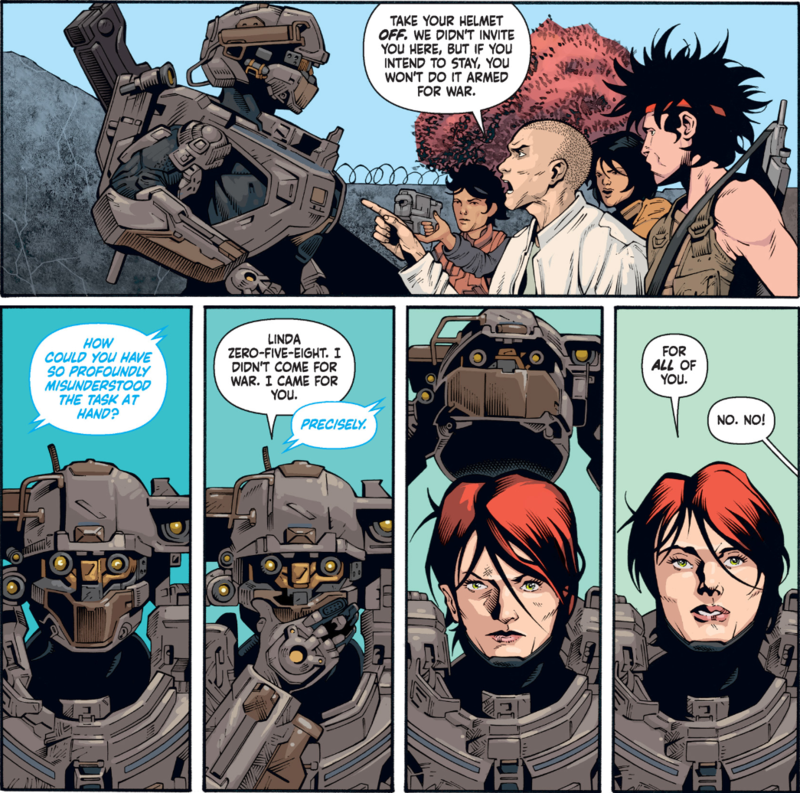 With the conversation that follows between these two women, it would perhaps be accurate to describe this as Halo’s take on a Sherlock Holmes story – the iconic detective taking the form of a genetically augmented supersoldier. Linda informs Shel that she followed her and Hala when they brought Martel’s body back to the settlement – the man who Chen disavowed as not truly believing in them, as it appeared he had been the one who contacted the UNSC – and notes that it looked like Shel knew exactly where to find him. Caught in her lie, Shel reveals that she went with Martel to call the UNSC and she was the one who sent the message. The Covenant arrived and opened fire on them, Shel managed to escape but Martel was cut down. I noted in my previous review that there’s something of a cracked-mirror parallel to be made between Chen with Atriox or Jul, with the framing of him as a sort of cult leader, and that is really starting to feel like conscious comparison. We are typically used to seeing zealotry from the Covenant angle, but, as they reach Linda’s ship to find it in flames, Hala burning it with a flamethrower, it becomes clear that Lone Wolf is reframing that angle as an examination of the human characters. Upon returning to the settlement and linking up with Athos, Linda is informed that the mission parameters have changed. An AI, thought lost with the Promise of Dawn, has been discovered – intact. The only AI (other than Cortana) that contains a complete record of all of human history. Issue #2 comes to a close with Athos declaring that this AI is now the entirety of their mission. While the identity of this AI is not yet known, it seems that we might have been given a potential clue. Kiki Wolfkill stated in the announcement interview that this experience has ties to the lore, as it is set after the events of Halo 3. The first thing that will happen at Outpost Discovery is that you will meet Gabriela, the resident AI of this project, and it seems that she will be something of a guide for things like the Hall of History, featuring graphics and props and artefacts related to stories from the series. Maybe sooner than that? Hint-hint. Lone Wolf #2 ups the pace and scale of the drama while maintaining more than enough breathing room for the characterisation of Linda and the other central characters of this story. Anne Toole has delivered another great issue that feels like a response to the questions posed by the first instalment, delivering a story that is not driven by events but the actions of its characters and their varying motivations. Credit must also be given to the work of Kieran McKeown (pencils), JL Straw (inks), Dan Jackson (colours), and everyone else involved in the art process, because it’s consistently great. Linda especially is drawn and coloured beautifully, as are many of the background environments and the way each panel is composed. 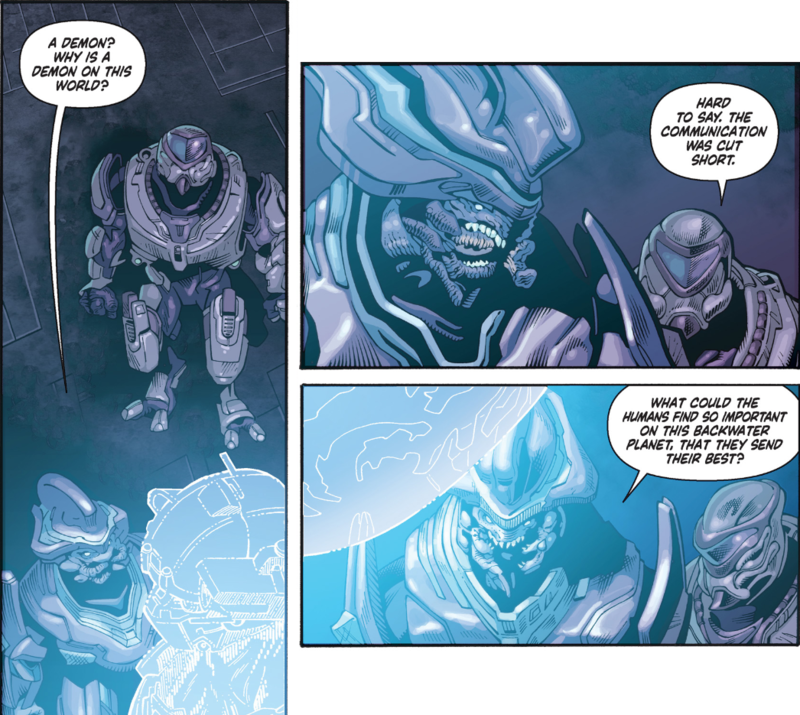 There are only a couple of panels where the Sangheili Officer looks like he’s raided a bit too much of the San’Shyuum’s 100,000 year matured kasna. 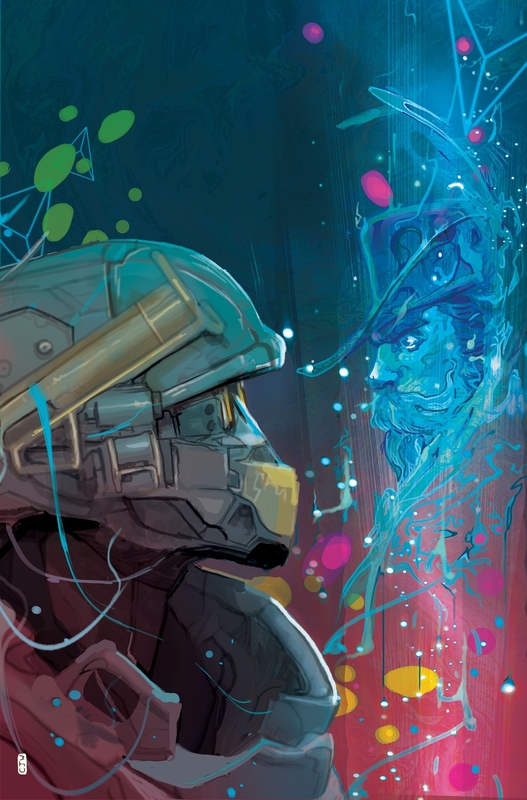 If you haven’t already, I wholeheartedly recommend picking up this comic and following its story – 2019 is continuing to deliver great narrative content for Halo and with two more issues to go, as well as Kelly Gay’s Halo: Renegades in just under two weeks, this train shows no sign of stopping! Next time (coming March 6th), the Covenant attack approaches and Linda must rally the people of Chen’s settlement to defend the AI – finding herself seeking help from the man she was sent to kill. You can purchase Lone Wolf #2 on Dark Horse’s site here. It’s also available on Amazon for your Kindle (UK | US), and a complete hardcover edition will be released June 25th 2019.